This entry was posted in Ambassadors, Awards, Badges, Cadettes, Juniors, Seniors and tagged #GSUSAAreYouListening, Girl Scout badges, Girl Scout history, Girl Scouts, Girl Scouts of the USA, gshistory, GSUSA, scout badges. Bookmark the permalink. I think they need to change the program once they hit Cadette and up. It should be more like Boy Scouts to teach accountability. All the badges offered for Cadette and up to Ambassador the same and have individual booklets for each badge. Then they should have to do so many badges in order to bridge to the next level. I’m not sure if that’s what you were asking or not. Amen, as a multi level older girl leader, upon seeing the new badge offerings I would search councils looking for retired IPP’s. I purchased a decent quantity of the badges the girls expressed interest in, often at a greatly reduced price. We are still able to work together across the scout levels. Nothing says alienation like separating a single ambassador from several seniors when they were in Cadettes together. Ok done on the soapbox. My senior was at national with 4 wings on her vest. It is packed with national park badges and Catholic awards. She worked harder and with more interest on these than on the official badges. She also has earned a number of IPs that are on the front. She would love to have more to earn (she earned all but one of the available cadette badges). My cadette is on a service unit robotics team. 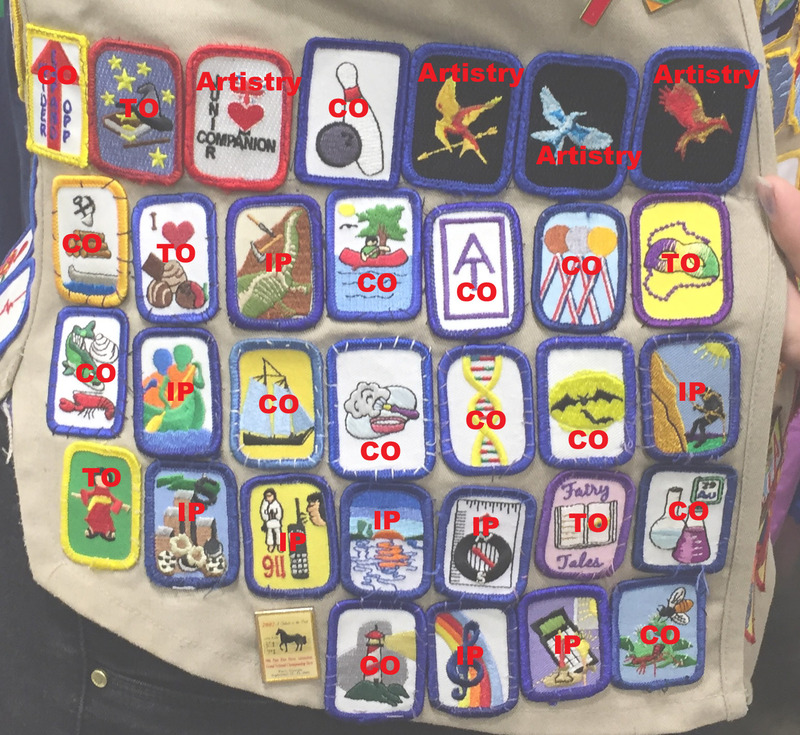 It is incredibly frustrating that the new robotics/coding badges are only for the younger levels. What timing. I went to our council office this morning only to find out the tubs and tubs of retired badges stashed in the back were all thrown out. Tons and tons of badges, pins, and awards all gone. I had told the clerk at one point that if they were ever going to throw them out to tell me and I’d drop what I was doing to come get it all. She said she wasn’t allowed to tell me. I am going to be sick to my stomach because I used them to supplement not just the older girl program but our Brownies and Juniors as well. Oh that is sad and frustrating to hear. To me that just shows how little they care about the girls and those who are trying to lead them. They would rather destroy badges that could have been purchased by very interested individual scouts and troops, instead of recouping money they say they need so desperately for programming and camps. Council and National makes me sick, they have their agenda and are determined to shove it down everyone’s throat. You are so right about more Badge Options needed. Especially for older girls. I am glad about the “once official, always official” badges, but we need more. 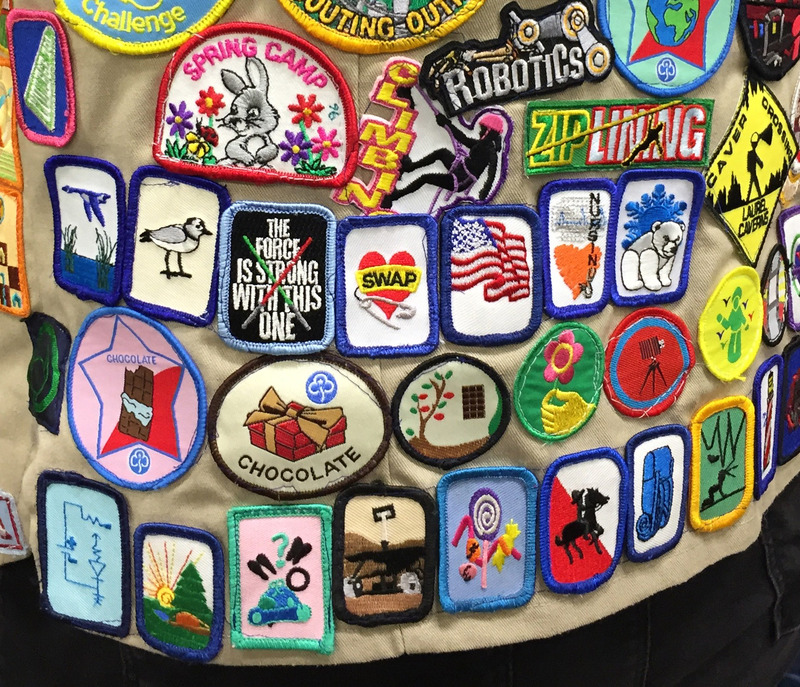 The girls of Girl Scouting have MANY interests. We must provide the great Program they are wanting. I will be searching for whatever is available for all levels. But to another GREAT point, YES! GSUSA needs to support all levels, including the older girls! shame on the council that threw out badges. That is money they threw away for that council. seriously promote them and get some money from it. 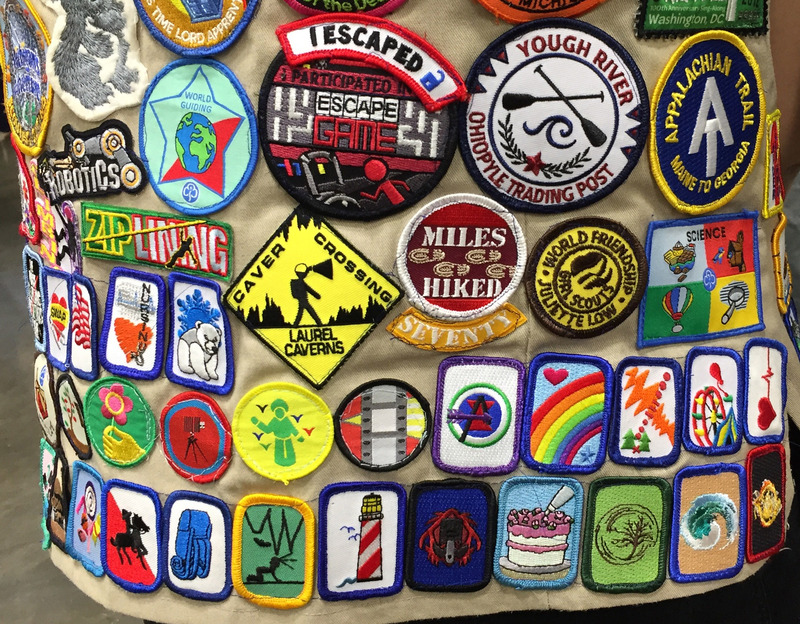 My graduated girl and my current high schooler are in a *very* active high school troop that doesn’t do badges. They camp, backpack, hold numerous events for younger girls, a blood drive, have girls earn Gold, go to GAM every year, but they don’t earn badges and never once has one of my girls complained about that. My 2nd year brownie is determined to earn all the retired try its. I searched hi and low for them all. She’s earned 5 times as many retired with me vs new earned in her troop meetings! I’m even sewing and selling badges for things she wants to learn just to fill the enormous gap in Girl Scouts. And you wonder why Boy Scout of The USA are going after girls. We need to listen up to what our young people want. Get your heads out of your books and offer some interesting badges like the older boys have offered to them. I have older girls and we have done the few badges that have gotten them interested but the last thing these ladies want is homework (school work ) like badges. Hands on is what they want!!!!! Ditch the journeys! Older girls don’t want to be bothered with that, but they still want to do silver and gold awards. They still learn the same things but the requirement is ridiculous really. And they dont have the time for them in addition to all their other work. So with you on this, Ann and others! The Journeys stink, the Council’s Own’s were great, Ambassadors was one split too many (all of high school should be pretty much one level unless the oldest girls focus on bridging to campus/adult scouts with actual programs for them once they bridge), the silkscreened badges are bright and colorful but soulless compared to embroidered badges, a troop should be able to work on things together whether or not they’re multilevel (and multilevel troops would solve a LOT of GS leaders’ problems – progression being taught from kid to kid and not just from adult to kids; siblings tagging along because the parent can only be in so many places at once; getting parents to help; diversity of parental support; kid availability because siblings can then be in the same troop…). As for councils THROWING OUT merchandise when there has been a secondary market for retired badges and patches for many years: this is a huge waste of resources and those folks should be reprimanded if not fired. If they don’t want to sell those items any more, fine, but give them away or find a secondary reseller who’ll sell them somewhere and recoup some of the costs. Frankly, I think GSUSA should have an official online store for retired items – anything councils don’t sell that is no longer “current” should go to that site and be sold from a central website (if not a central warehouse). Troops and individuals would have an easier time finding what they need; GSUSA would have a better idea of what’s truly selling; all those materials wouldn’t be wasted; the landfill wouldn’t be getting overloaded with actually useful items. My daughter’s vest is featured in this article. Hers is the one with 18 badges. Let me tell you how that happened. My Cadettes last year were in their annual planning meeting and they were going through the available badges. After about an hour or so of discussion, they told me that they didn’t like any of their choices. I said what do you want yo do about it? Brainstorming resumed… we want to do badges that are interesting… what’s interesting to you? So, they decided to each create their own badge and present it to the group. The rules were that they had to follow the 5 badge steps and I had to approve it before presentation. The deal was if they did their part, my part would be to find appropriate badges to correspond. My beautiful girls did badges on the following topics: Harry Potter, Disney, You Tube, Internet Safety, Parody and Copyright Law, Dr. Who, Feeding Homeless Women and Children, Self Defense and Personal Protection, and Girl Vs. World. I am so glad that these young women took the initiative tob make the program their own, and couldn’t be prouder of them!!!! Every single girl participated in “Girl Scouting Our Way”. A wise soul once told me that I am the badge police, and I couldn’t think of a single legal reason why these badges shouldn’t be worn on the front of the vest because they were created and earned for and by Girl Scouts. Thank you so much for your article and for including my DD in it. Thank you for writing!!!! I wondered if anyone would recognize the vests. I would love to have the badge requirements to go into my archive (gscobadge.info). Sure, I’m happy to send them over. I’ll gather them this weekend for you. The requirements are all there, in the old handbooks. For troop and council own, there’s the internet. With the advances in computerized embroidery machines these days, there should be no reason why troops can’t earn any badge they want to! I was able to replicate my old red-on-green council strip to put on my patch jacket so that the original could go back on my old Senior uniform. I wore that jacket all over the convention and the historian’s conference (along with the Roundup uniform) and unless I told them, no one noticed any difference. As long as the badges we “re-create” are for personal use and not for sale, I feel that skirts any copyright infringement. So why not? Thank you so much for writing about this. I am an ambassador level girl, and I have argued since I was a cadette that after a certain age girl scouts becomes a babysitting gig. Everything it seems like is focused for the younger ones while older girls are asked to watch or help them. Nothing wrong with helping or watching occasionally, but older girls should have things focused for them and only them. I have a troop of 35 girls in grades 6 – 12. I need badges for them! I need stuff that can be done in one or two meetings or one camping trip. The journeys are too long, too amorphous and talk about outmoded! MEdia – has girls learning about blogs – help! Blogs are dead already. Badges are so much more adaptable. Modern girls don’t show up every week or even every other week for meetings. We need to adapt. I’ve been emailing and writing GSUSA about how we need a Self-Defense badge back – one would think that with what’s happening now, that would be a priority. No, I am ignored – please write GSUSA if you agree with me! STEM is wonderful – I’m a programmer myself – but women leave STEM professions because of harassment – all the STEM in the world won’t prevent that unless we also concentrate on strengthening the girls’ sense of self and self defense! Anne, we did your Catching Fire program a few years ago and they loved it.